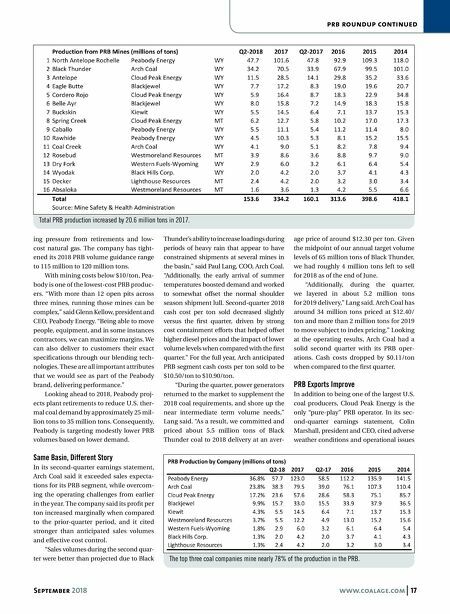 September 2018 www.coalage.com 17 prb roundup continued ing pressure from retirements and low- cost natural gas. The company has tight- ened its 2018 PRB volume guidance range to 115 million to 120 million tons. With mining costs below $10/ton, Pea- body is one of the lowest-cost PRB produc- ers. "With more than 12 open pits across three mines, running those mines can be complex," said Glenn Kellow, president and CEO, Peabody Energy. "Being able to move people, equipment, and in some instances contractors, we can maximize margins. We can also deliver to customers their exact specifications through our blending tech- nologies. These are all important attributes that we would see as part of the Peabody brand, delivering performance." Looking ahead to 2018, Peabody proj- ects plant retirements to reduce U.S. ther- mal coal demand by approximately 25 mil- lion tons to 35 million tons. 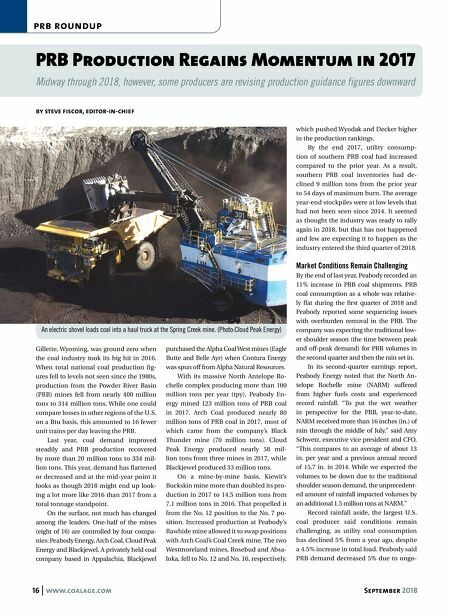 Consequently, Peabody is targeting modestly lower PRB volumes based on lower demand. Same Basin, Different Story In its second-quarter earnings statement, Arch Coal said it exceeded sales expecta- tions for its PRB segment, while overcom- ing the operating challenges from earlier in the year. The company said its profit per ton increased marginally when compared to the prior-quarter period, and it cited stronger than anticipated sales volumes and effective cost control. "Sales volumes during the second quar- ter were better than projected due to Black Thunder's ability to increase loadings during periods of heavy rain that appear to have constrained shipments at several mines in the basin," said Paul Lang, COO, Arch Coal. "Additionally, the early arrival of summer temperatures boosted demand and worked to somewhat offset the normal shoulder season shipment lull. Second-quarter 2018 cash cost per ton sold decreased slightly versus the first quarter, driven by strong cost containment efforts that helped offset higher diesel prices and the impact of lower volume levels when compared with the first quarter." For the full year, Arch anticipated PRB segment cash costs per ton sold to be $10.50/ton to $10.90/ton. "During the quarter, power generators returned to the market to supplement the 2018 coal requirements, and shore up the near intermediate term volume needs," Lang said. "As a result, we committed and priced about 5.5 million tons of Black Thunder coal to 2018 delivery at an aver- age price of around $12.30 per ton. Given the midpoint of our annual target volume levels of 65 million tons of Black Thunder, we had roughly 4 million tons left to sell for 2018 as of the end of June. "Additionally, during the quarter, we layered in about 5.2 million tons for 2019 delivery," Lang said. Arch Coal has around 34 million tons priced at $12.40/ ton and more than 2 million tons for 2019 to move subject to index pricing." Looking at the operating results, Arch Coal had a solid second quarter with its PRB oper- ations. Cash costs dropped by $0.11/ton when compared to the first quarter. PRB Exports Improve In addition to being one of the largest U.S. coal producers, Cloud Peak Energy is the only "pure-play" PRB operator. In its sec- ond-quarter earnings statement, Colin Marshall, president and CEO, cited adverse weather conditions and operational issues Total PRB production increased by 20.6 million tons in 2017. The top three coal companies mine nearly 78% of the production in the PRB.